The Stadium Moustoir also called Stade-Yves Allainmat is the home stadium of FC Lorient, who are based on the West Coast of France. Since undergoing renovation in 2010, and the addition of a new southern stand, the ground can hold up to 18,500 spectators. FC Lorient have resided at Stade du Moustoir for the past 50 or so years, having moved into the ground on July 1959. Prior to this the club played their matches at Parc des Sports which was a municipally owned stadium and sports park which was built to host a diverse range of events from Athletics, boxing, cycling (6th stage of the tour de France in 1956) and last but not least Football. 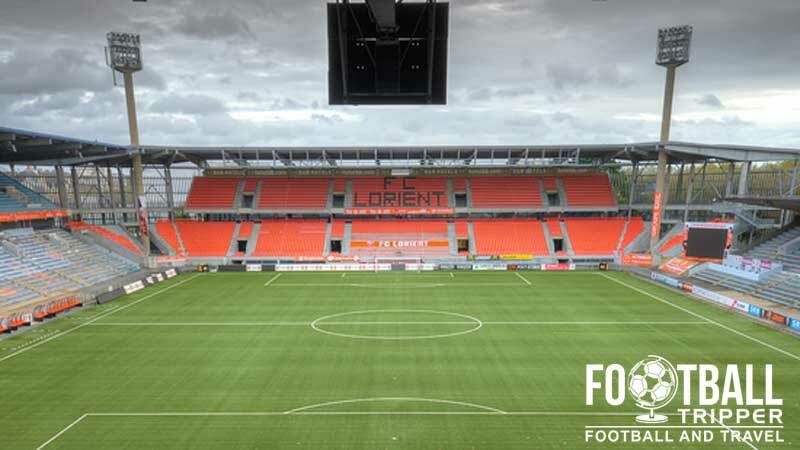 With the rise of interest in Football in France post World War 2, FC Lorient eventually sought to build their own bespoke stadium in order to satisfy growing the increase demand for tickets and to offers fans a much better match day experience. Both of these were not possible at the previous site of Parc des Sports as the 6,000 capacity stade was falling into a state of disrepair. The new stadium and answer to all of Lorient’s problems was named “Stade du Moustoir” after the district it is situated in, although some refer to it as Stade Yves Allainmat after the former Mayor of Lorient who served the city between 1965 – 1973 who greatly encouraged recreational sports. The newly formed ground remained untouched for nearly the next 40 years until renovations occurred in 1998, although these were not the direct result of France hosting the World Cup. The €10 million euros project finally rid the ground of the athletics track and replaced two of the four stands which increased the stadium’s capacity by 5,000, and 10 years later the South stand was finally upgraded to 4,500 seats which brings Moustoir up to its current capacity of 18,500. Moustoir can be divided into four sections: Nord, Est, Sud and Ouest. 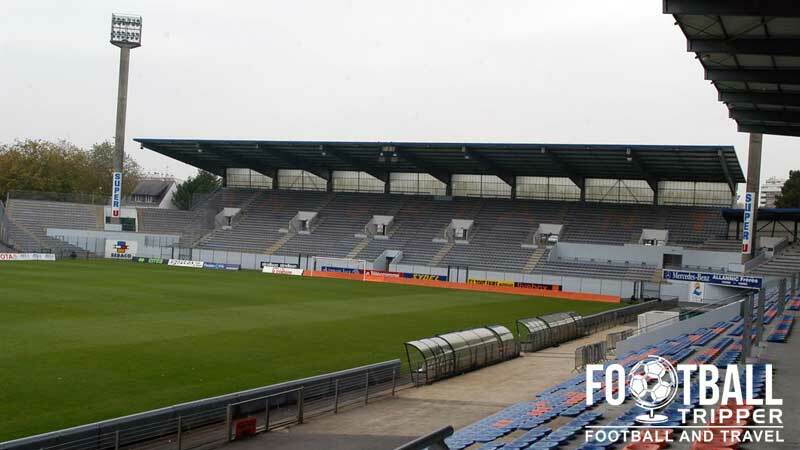 Away fans who make the trip to see their team take on FC Lorient are housed within a small section of seating in the north-west corner. Although adjoined to the northern goal-end, it is separated by a row of steel fencing, and unfortunately the roof doesn’t quite cover the seats here which means the travelling supporters are somewhat exposed to the elements. The map below outlines some of the most football fan friendly bars within the city centre of FC Lorient. The majority of them are located south-east of the ground within no more than a 15 minute walking distance. Lorient is a decent sized town with plenty of dining options either before or after your football match. Located very close to the main train station of the city, Stade du Moustoir is in a prime location for overpriced, fast food options with notable choices including Pizza Sprint, Subway and numerous Crêpe places such as Crêperie La Rozell. The city’s “proper” cuisine broadly falls under the category of Breton with a traditional use of speciality seafood such as Jacques Scallops and Oysters, although the local residents are also partial to cakes and baked good such as a Sausage rolls. 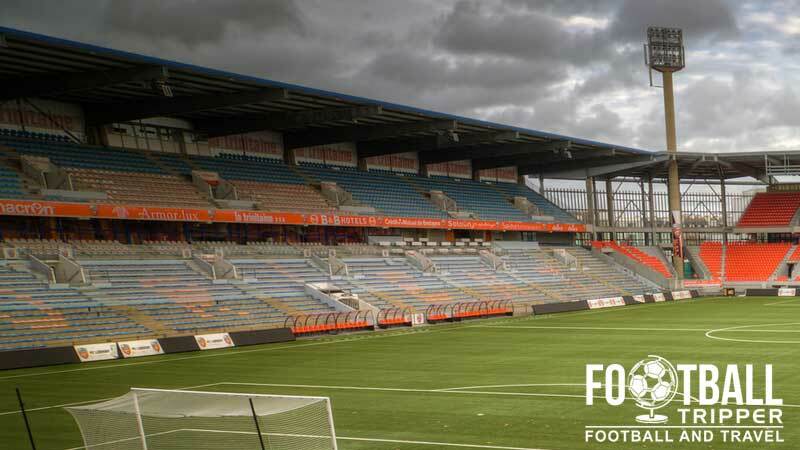 FC Lorient have a newly opened official store at Stade du Moustoir located in Super G Tribune which is the South stand, as well as an online boutique. Tuesday – Saturday 10.00 am – 12.00 pm and from 2.00 pm – 6.30 pm. Matchdays: A few hours before kick-off. The quaint little club shop has a certain charm about it compared to other megastore emporiums. The phone number for the store is +33 (0) 2 97 35 27 09. There really isn’t much to see of stage-Yves Allainmat and it’s no surprise that there isn’t a stadium tour of the ground which was constructed in 1959. Expect this to change if Lorient ever move to a new home though. 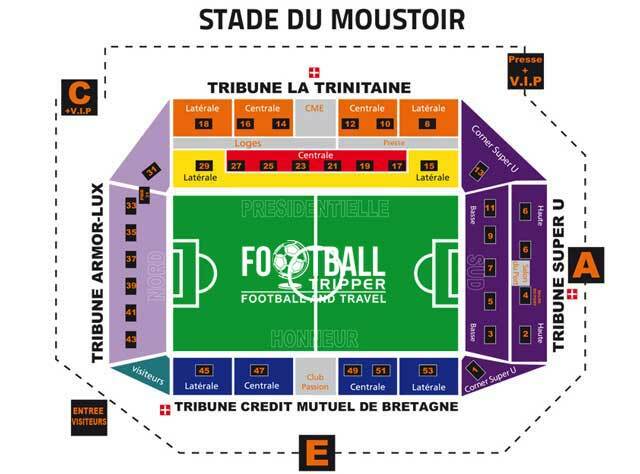 Tickets to watch Loreint Football Club play at the Moustoir can be purchased via the usual French Channels: Online, at the ticket office or shop at the stade (Note: Closed on Mondays) or at any of the numerous ticket vendors around the city such as Francebillet. Hake FC are one of the smaller clubs in the top flight of French football and attract crowds which are often less than the fully 18,000 odd capacity, meaning you can attempt to purchase tickets in the days leading up to the match. The cheapest ticket in the house comes in at €10.00 which places you in the standing terrace within one of the corner sections, with seats behind the goal coming in at €20.00 and central main stand places setting you back €60.00. 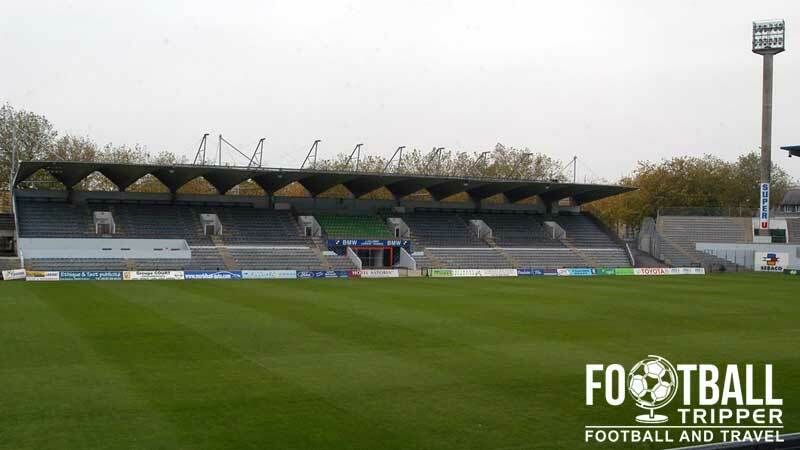 Stade Moustoir or Stade Yves Allainmat is located very centrally within the coastal city of Lorient with the ground essentially parallel to the train station, albeit a few blocks away south. The recently renovated facade of Stade du Moustoir. Sort of looks like a cross between a library and a multi-storey car-park. If you are driving to the city or the stade then you will likely be arriving from the E60 motorway. Depending on whether you are heading from East or West, you could exit onto the D724 to get into the city, or Exit 43 onto D465, both of which require you to follow signs for Moustoir city centre. There doesn’t appear to be any official on-site carparks at the Stade du Moustoir however Parkopedia Stade du Moustoir suggests there is quite a lot of free parking nearby. Gare de Lorient is the main railway station of the city and as previously alluded to, is less than 5 minutes North of the stadium. TGV (high speed) services ensure Lorient is accessible to the rest of the country with direct services to Paris, Rennes and Quimper making it a popular French getaway. The nearest airport to the city is undoubtedly Lorient Airport at 9Km West of FC Lorient’s home but it is currently only used for military and non-commercial aviation purposes. The closest International airport in Breton is therefore Nantes Atlantique Airport which is 30km North-West of Nantes and on average a 2 hour drive to the city of Lorient. Maybe consider a rental car. As Lorient’s Stadium is very centrally located and right next door to the station there are lots of hotels which tick both boxes with the Inter-Hotel Cleria and Ibis Lorient Centre Gare being two choices with decent reviews.